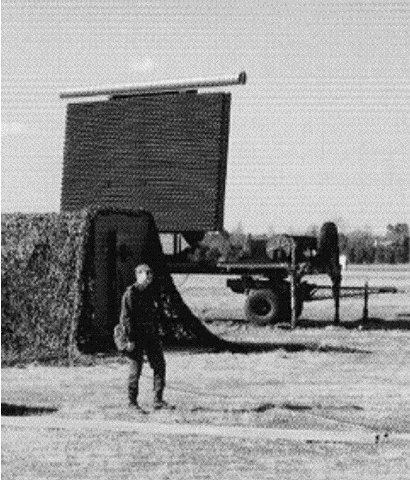 This family of E/F-Band air defence 3-D radars, employing electronic phase scanning in elevation, is derived from the height-finding radar SATRAPE which has equipped the French Air Force. The primary radar antenna is a direct radiation array of stacked linear subarrays fed by two vertical distributors used to form the sum and the elevation difference channels. Each linear subarray contains elementary sources radiating a circularly polarised wave. The two waveguides allow monopulse operation to perform the height-finding function. Digital electronic phase shift networks inserted between the elementary feeds and the corresponding directive couplers control the pointing of the beams. The transmitter is an amplifying chain transmitter using a crossed field amplifier as its final tube. It permits the use of the pulse compression technique and that of pulse-to-pulse frequency agility. The receiver circuits comprise the anti-jamming chains and three angle error chains. The MTI device processes the signals received from any one of the three lower beams by programming. The extractor performs the extraction of primary and secondary plots and allows them to be associated together. It is followed by a plot processing system which computes altitude and filters plots so as to transmit only useful data. The device generates the data in a digital form permitting the transmission of tracks to a remote centre. The monitoring desk groups the monitor controls of the station's operation. TRS 2215s are quoted as being supplied into France's Strida (Système de traitement et de représentation des informations de défense aérienne) national air defence network. 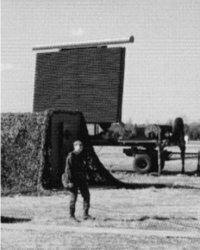 The same radar with an enlarged antenna for a fixed installation is produced under the designation TRS-2230. TRS 2230D can act as a station remotely controlled by a distant Command and Reporting Center (CRC).